The rate at which technology is moving in today’s age is quite astonishing. While once upon a time you could almost guarantee that everyday life would be quite the same from one year to the next, it’s now impossible to get an accurate idea of how the future is going to turn out for most industries around the world. One such industry, is banking and financial services. Short term loan provider, Mr Lender, looked at what the future holds for banks in the UK and around the world. The biggest and most imminent change is the transition from physical, brick-and-mortar bank branches, to a more virtual banking experience. As more and more people become dependent on banking apps as opposed to speaking to a bank teller face to face, it’s quite likely that bank branches will become a thing of the past. According to the British Banking Association (BBA), 19.6 million people used banking apps in 2016. Business Insider say millennials are using traditional bank branches increasingly less often. According to Reuters, the total number of bank branches to have closed in 2017 alone will tally to around 762 – up from the 583 closed in 2016. Reuters estimate that this will leave the UK with around 8,000 bank branches in total, which is almost 10,000 less than in 1989. RBS and NatWest are just two banks which will be closing a number of their branches as a result of the transition to online banking. NatWest are set to close 197 branches, while RBS will be closing 62 – meaning around 838 jobs will be lost in total. Both Lloyds and Yorkshire Building Society are also set to close a number of their branches in the near future. As more well-established banks are having to adapt to provide a more tech based service, new entrants to the market are simply cutting out the traditional bank branches and providing an online only service. Banks such as Ally in the US, Monzo, Tandem, N26 and Fidor in Europe, Digibank in India, and B1NK in Kazakhstan, are all banks which operate solely online and cut out the need for bank tellers entirely. In October 2016, KPMG predicted that technology would advance to the point where banks and banking services in general would become invisible to the consumer at some point in the future. They say banking will instead be carried out using an almost ‘Siri’ or ‘Alexa’ style personal assistant. Without the need for in-branch transactions, it’s likely that ever more traditional branches will close their doors and bank tellers will be replaced by Artificial Intelligence (AI). Fintech Lead at KPMG, Warren Mead, said “banks are making efforts to improve customer service through use of existing technologies like robotics, artificial intelligence and blockchain, but the pace of change is slow and in reality, I’d say banks are only 10% of their way through their digital transformations. As with everything, the future is hard to predict – especially when technology is involved. In 2013, The Telegraph predicted that by 2018 machines would replace bank staff in high street branches across the UK. While it’s still possible that this could happen by next year, it’s unlikely that they’ll be replaced entirely over the next 12 months. At one point in time, transactions could only be carried out using cash or cheque, then along came credit and debit cards, then the cards became contactless payment, now transactions can be made using a whole variety of tools including watches and mobile phones. As consumers demand an ever more convenient way of living and getting about their day to day lives, it’s quite likely that many other methods of payment will be introduced over the next few years. It’s quite possible that the prospect of being fitted with microchips as a means of payment is universally recognised in the future – as is already the case in Sweden. Some employees in the Scandinavian nation are choosing to be implanted with microchips to replace cash cards and ID passes. This idea of using our bodies as a way of accessing our bank accounts and making payments seems to toe the line between ensuring our money is kept safe and secure, and being far too easily accessible. Brian Roemmele from Payfinders and Multiplex said “imagine your own personal assistant – a digital earpiece linked to your mobile phone – hearing and remembering everything you do, say, listen to and storing it safely in the Cloud just for your benefit. “So, when you want to remember a product you heard about, or the name of that person you sat next to at dinner to years ago, the system can remember and tell you. Now link that kind of functionality to your financial life … and with a smart financial advisor that can help you manage your money more efficiently, and you have an incredibly powerful tool. 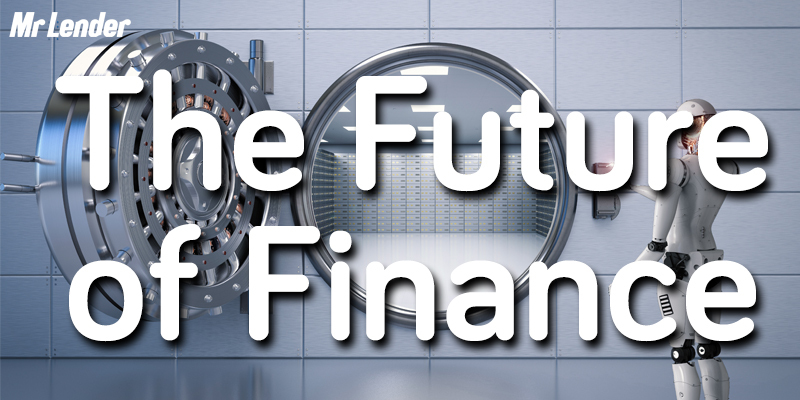 Technology is by far the biggest game changer for the finance industry. Apps and alternative digital methods of payment are set to dominate the way in which we monitor and control our income and expenditure – in the short term at least. In the long term it’s quite possible that brick-and-mortar bank branches will be changed forever. Payments and monitoring of our bank accounts will be entirely contactless and will likely depend on something as simple as iris recognition, or voice activation. The biggest question we need to be asking is quite possibly, how secure is this means of accessing our accounts? Can we trust artificial intelligence to oversee our personal finances and to have that much access to our personal information? The only way to truly know is to just sit back and wait. Previous Previous post: Robots: Are They a Threat to the Workforce and Should We Be Worried? Next Next post: National Lottery UK: Is It Really Worth Taking Part?